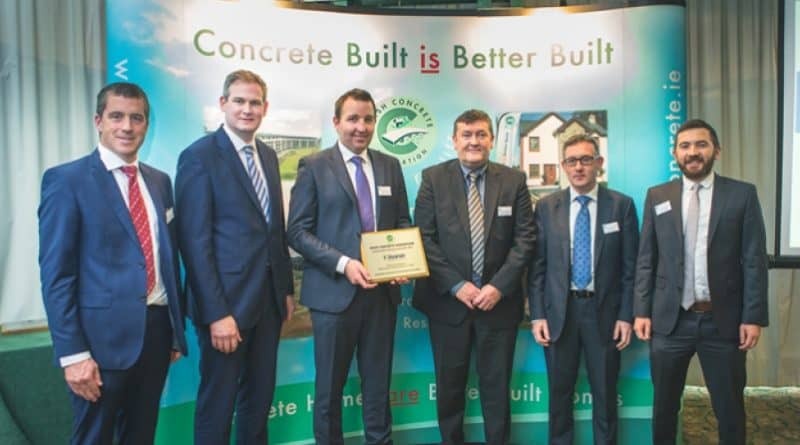 Kilsaran International, from Dunboyne, Co Meath, were double winners at this years’ Irish Concrete Federation Sustainable Quarry Awards. Their Gallstown Quarry was awarded the top prize as National Winner with the citation “Outstanding Achievement in Comprehensive Environmental Management of a Large Integrated Extractive Operation” While “Outstanding Achievement in Overall Quarry Sustainability” went to their quarry at Ballinascorney in South County Dublin. Speaking after the event Kilsaran’s Operations Director, Derry McKeown, said, “We’re delighted to be recognised by our Industry with these National Awards. The quarrying sector, through the work of Irish Concrete Federation is now more than ever aware of its responsibilities to the environment and the sustainable use of natural resources. Gallstown Quarry which is owned and operated by Kilsaran is located 6 miles north of Drogheda in County Louth. This large modern quarry produces a wide range of aggregates, concrete products, asphalt and macadam, hard-core and fill materials. A pioneering approach to production helps maximise the full potential of the rock being quarried at Gallstown in line with the principals of sustainable development. At Gallstown the winner uses quarry dust and lower quality screenings to produce high value manufactured sand by using specialised crushing, washing and screening technology. In the past these materials were low value bi-products of quarrying. The new product is now used on-site in the manufacture of high quality readymixed concrete and blocks. As with all of Kilsaran’s quarries Gallstown operates under a comprehensive environmental management system where aspects such as energy use, emissions and use of natural resources are monitored and managed in a sustainable way. For more information on Kilsaran, please follow Kilsaran on social media, www.twitter.com/Kilsaran, www.facebook.com/kilsaran.home/ and check out the website, http://www.kilsaran.ie/.